A bit late in the week for a new post, but I’ve had a hell of a week and my writing is off-pace so screw it, I’m only writing 2000 words today and am going to finish up with a blog post instead. It has it’s variants, too: “What inspires you?” or “where do you look for inspiration?” and stuff like that. It’s a perfectly reasonable question, too – lots of people would like to know where an author gets his or her ideas. Seems pertinent, interesting, and so on. How I feel answering that question. Except it’s totally unanswerable. I mean, sure, there are rare occasions where I can trace an idea back to a particular moment in time, but the vast, vast majority of my “inspiration” is ineffable. It is the particulate matter filtered from the substrate of my life and experiences. Asking somebody (anybody!) where they get their ideas is kinda like asking “why do you like grapes?” Jesus – hell if I know! Why do you like grapes? Did you take a grape aptitude test? Is enthusiasm for grapes a genetic trait shared with your extended family? Did you, on March 17th 1985, eat a grape and then, from that moment on, grapes and you were best buddies? Or was it just, you know, that article in The New Yorker you read last year that talked about how good grapes taste? Now, I usually try not to answer that question that way because it’s a bit rude and the interviewer is nice enough to do me this favor of interviewing me and I don’t want to be a jerk. But the answers I furnish (I read history; I’ve worked a lot of odd jobs; I loved book X which inspired me to riff off the concept of Y) are half-truths and abstractions. Inspiration is not a mechanical process or a simply understood one. Our ideas are synthesized from the full range of our experiences and combine in odd and unpredictable ways and I can’t tell you how it works because it isn’t a thing that I can explain. It’s a frustrating question, therefore, no matter how reasonable it is. From a box buried in my yard. There are lots of ideas in there scribbled on paper. I don’t know how it got there. All of my ideas come exclusively from the crawl at the bottom of MSNBC. I play Bananagrams long enough that, by random chance, whole plots are formed in the random scatter of letters. I steal my ideas at gunpoint from local “creatives.” Then I make them sign a non-compete. I have no ideas. Ideas are an illusion. We are all an illusion. Nothing really matters. At night, I throw off my human husk and feed off the dreams of neighborhood children with my single, jawless mouth. I trapped a leprechaun once and made a wish. If you stare at Twitter long enough, ideas are formed in your brain like tumors. Then you have to remove them through your nose with a long, pointed hook before they become malignant and turn into pop songs or commercial jingles. This is, incidentally, why pop songs and jingles get stuck in your head – you had an idea, but didn’t remove it in time to save it. I keep my eyes open when I yawn, and then I see the ideas the gods tried to hide from me. This guy named Leon. No, not that Leon – you don’t know him. If you did, you’d have the same ideas I do, and then we’d have to have a duel to the death like in that show Highlander. No, not the movie, the show. I gained access to my permanent record from elementary school, wherein I discovered that all my creative ideas were siphoned out by my teachers during recess and stored for a later date. You need to get an Idea License. There’s a course you take down at the city annex and a twenty question true/false exam. Costs like $40 or something. Do you remember a time when you believed there were people living on the moon? Or Mars? Or Venus? I do. I’m a kid – no older than eight – reading Ray Bradbury in a sunny room, thinking about the color of the kids’ raincoats on Venus. A casual browse through my shelves will reveal reams of construction paper upon which has been illustrated a wide variety of spaceships, including the Costello – an interplanetary craft based upon the rough outline of the swing set in my backyard. On the floor, scattered about on their launch pads, a legion of Lego spaceships point through the skylights of my bedroom, waiting for lift-off. This is me before true scientific understanding had dawned. Before I had my subscription to Odyssey, before I learned everything I could about the Solar System and beyond. This was when I still thought there might be Martians and wondered whether they were friendly or not. Guess which one grew up to be Ethan Hawke. 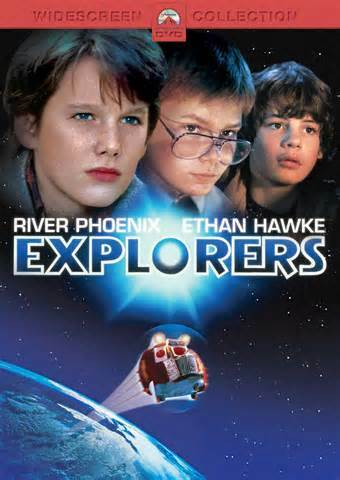 Explorers was released in 1985. I did not see it in the theater – I didn’t know it existed until probably a few years later, when I was browsing through the local video rental store (remember browsing the rental store? Man, I loved that!) and saw it sitting on the shelf. The movie was, along with The Goonies, a representation of all my idealized childhood fantasies. A couple kids manage to build a spaceship out of junk in their backyard and fly off to explore the universe. Never mind how they did it (I don’t really remember – something about a computer program that makes bubbles out of thin air, I guess – this was also back in the days when computers were tantamount to MAGIC). The important point is that three kids, without the need for adults, built a spaceship and went off to explore space. I’m probably missing some, too. In any case, I grew up thinking fantastic adventure was just around the corner. All I needed to do was meet a crazy inventor or stumble upon a meteorite or get locked in the National Air and Space museum after dark and discover, to my shock and wonder, that the Apollo Capsule still worked! And when I did manage to travel through time or open a portal to another world or fly off to Mars, there would be people there. Life, in this halcyon age of my imagination, was as common in space as it was here on Earth. Every planet would have a secret ecosystem of aliens creatures waiting to be explored and (possibly) zapped with a ray gun. There would be cultures of intelligent creatures there, both primitive and advanced, and I would make friends and enemies, establish diplomatic relations, and so on. I swore I’d have a flying car by now and that space stations would be places people went for vacation or stopped over on their way to Saturn. I was wrong, of course. Space isn’t really like that or, at least, it doesn’t appear to be. It is vast and mostly empty and our planet is a little island of blue all alone in a sea of black, not just one member of an archipelago of habitable worlds. Getting off this rock seems harder and harder, even as it also looks to be more and more essential that we manage it. I wonder if this is just part of growing up for everybody or whether my generation was uniquely spoiled – probably the former. I also wonder: do the kids of today have similar dreams? Do they hope to explore the Great Unknown? I worry sometimes. I seem to meet a lot of young people who don’t bother looking past the ends of their noses and whose ideas of the future involve merely a steady job and a 401K (if that). That’s not enough, though. We need to look further than the necessities of our own survival. We need to be dreamers – crazy dreamers – if we’re going to have a shot. When somebody accuses of you of riding moonbeams, you need to take it as a compliment. It’s gotta be better than just squatting in the dirt, right? 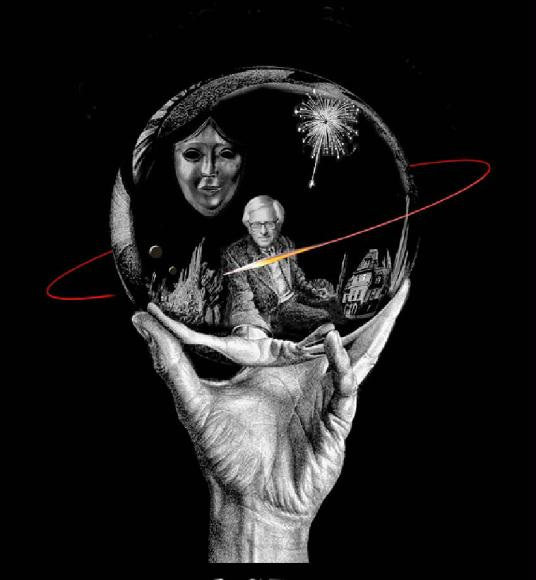 Is it sacriligeous for me to say that I’m not a huge Ray Bradbury fan? I don’t mean to imply that I thought him talentless, mind you – he was a marvelous writer with a prolific imagination and the accolades poured upon his name are sufficient to summon the respect of even the most cynical critic. That said, in reflecting on the great writer’s passing, I am having difficulty thinking of something he wrote that really resonated with me. He is not, I can say with a degree of confidence, one of my inspirations. Nevertheless, I mourn his passing along with the rest of the speculative fiction world. He was one of the greatest among us; he helped make this genre and its cousins into something more than just primetime radioplay doggerel. There is a certain, elemental simplicity to Bradbury’s storytelling that gives it power. It is plain, clear, and devoid of unnecessary embellishment; a kind of spartan, modernist beauty, like the set of a Star Trek episode. When I think of him, I think of the colors of the Golden Age of scifi–silver, gold, gray, brown, red. He is the 1950s, cleft-chin, clear-eyed, faith in science and hope for humanity’s wisdom (even though so much of his work doubted that self-same wisdom’s existence). With him I think of moon rockets and my childhood subscription to Odyssey magazine. I think of lying on the carpet, staring through the skylight, and thinking of astronauts. Perhaps it is premature of me to dismiss him as an inspiration. Perhaps, instead, the inspiration he gave me runs so deep it has become difficult for me to separate it from the essential nature of my being. I am more than inspired by him; I am built out of him. He gave me, and so many others, a framework upon which to hang our wildest dreams.